This article is about the 1990 musical. For other uses, see Assassin (disambiguation). As a panelist at producer Stuart Ostrow's Musical Theater Lab, Sondheim read a script by playwright Charles Gilbert, Jr. Sondheim asked Gilbert for permission to use his idea. Gilbert consented and offered to write the book; but Sondheim declined, having already had collaborator John Weidman in mind. Weidman had written the book for Pacific Overtures and would work with Sondheim again on Road Show. 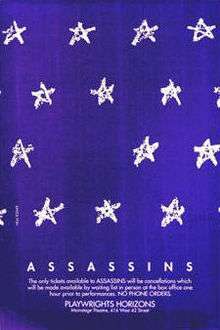 Assassins opened Off-Broadway at Playwrights Horizons on December 18, 1990, and closed on February 16, 1991 after 73 performances. Directed by Jerry Zaks the cast included Victor Garber, Terrence Mann, Patrick Cassidy, Debra Monk, Greg Germann, and Annie Golden. According to the Los Angeles Times, "The show has been sold out since previews began, reflecting the strong appeal of Sondheim's work among the theater crowd." Frank Rich in his New York Times review wrote "Assassins will have to fire with sharper aim and fewer blanks if it is to shoot to kill." On October 29, 1992, Assassins opened in London at the Donmar Warehouse with direction by Sam Mendes and a cast that included Henry Goodman as Charles Guiteau and Louise Gold as Sara Jane Moore. The show ran for 76 performances, closing on January 9, 1993. The first US regional production was mounted by the San Jose Civic Light Opera in San Jose, California in 1993. This was the world premiere of the 13-piece orchestration by Michael Starobin. Next was the New Line Theatre in St. Louis, Missouri in 1994, and it was re-mounted by that company in 1998 and 2008. Roundabout Theater Company's Broadway production was originally scheduled for 2001 but was postponed to April 22, 2004, because the content was sensitive in light of the events of September 11, 2001. After 101 performances at Studio 54, Assassins closed on July 18, 2004. Directed by Joe Mantello, with musical staging by Jonathan Butterell, Neil Patrick Harris starred in the roles of The Balladeer and Lee Harvey Oswald, with Marc Kudisch in an extended role as The Proprietor. Michael Cerveris played John Wilkes Booth, for which he received a Tony Award. The 2004 production was noted for a coup de théâtre: the Zapruder film of the death of John F. Kennedy projected onto Lee Harvey Oswald's T-shirt by Projection designer Elaine J. McCarthy. On 3 December 2012, the Broadway cast reunited for a special benefit. Other professional productions have included a 2006 production at Crucible Theatre, Sheffield, a 2008 production which ran from January 23 to February 2, 2008, at the Landor Theatre, London, The South African premiere opened in December 2008 as the inaugural production of the NewSpace Theatre in Cape Town. This production was directed by Fred Abrahamse with a South African cast including Marcel Meyer as John Wilkes Booth, Riaan Norval as Lee Harvey Oswald, David Dennis as Charles J. Guiteau and Anthea Thompson as Sara Jane Moore. The Los Angeles premiere opened in 1994 at the Los Angeles Theatre Center and included Patrick Cassidy (the original Balladeer) playing Booth, and Alan Safier as Guiteau. A 2010 production in Toronto by BirdLand Theatre and Talk is Free Theatre won the Dora Mavor Moore Award for Outstanding Production in the Musical Theatre Division. The Union Theatre, London, produced Assassins in July 2010, which went on the win Best (overall) Production at The Off West End Awards. It was staged and directed by Michael Strassen. It attained Show of the Week and Critics choice in Time Out. A new production of Assassins starring Catherine Tate as Sarah Jane Moore, Aaron Tveit as John Wilkes Booth, and Jamie Parker as the Balladeer opened on November 21, 2014 at the Menier Chocolate Factory in London and ran until March 7, 2015. The three versions (original, London and Broadway) were not identical, as roles were combined, and the song "Something Just Broke" was new to the London production. In 1991, Theatre Communications Group published the libretto, which did not feature "Something Just Broke". The current licensed version of the musical reflects the 2004 Broadway revival. Although the script does not combine The Balladeer and Oswald into a single role, many productions have followed the revival in doing so. Ensemble: crowd members, chorus, etc. This synopsis reflects the current licensed version of the show. The published script of the 1992 Off-Broadway production is slightly different. The play opens in a fairground shooting gallery where, amid flashing lights, human figures trundle past on a conveyor belt. One by one, a collection of misfits enters the stage, where the Proprietor of the game entices them to play, promising that their problems will be solved by killing a President ("Everybody’s Got the Right"). Leon Czolgosz, John Hinckley, Charles Guiteau, Giuseppe Zangara, Samuel Byck, Lynette "Squeaky" Fromme, and Sara Jane Moore are given their guns one by one. John Wilkes Booth enters last and the Proprietor introduces him to the others as their pioneer before he begins distributing ammunition. The assassins take aim as "Hail to the Chief" heralds Abraham Lincoln's offstage arrival. Booth excuses himself, a shot rings out and Booth shouts, "Sic semper tyrannis!" The Balladeer, a personification of the American Dream, appears and begins to tell John Wilkes Booth's story ("The Ballad of Booth"). The scene changes to Richard H. Garrett's barn in 1865. Booth, mudstained and with a broken leg, is attempting to write his reasons for killing Lincoln in his diary but cannot hold the pen. He forces his associate David Herold to write for him at gunpoint. As Booth dictates, blaming Lincoln for the Civil War and for destroying the South, the Balladeer interjects that Booth's motives really had more to do with his personal problems. When a Union soldier calls for Booth's surrender, Herold abandons him and surrenders. In desperation, Booth throws the Balladeer his diary so that he can tell his story to the world. The Balladeer reads out Booth’s justifications, and Booth laments that the act for which he has given up his life will not be enough to heal the country. As the Union soldiers set fire to the barn, Booth commits suicide, and the Balladeer concludes that Booth was a madman whose treacherous legacy only served as inspiration for other madmen like him to damage the country. The Balladeer rips Booth's rationale from his diary and burns the pages. The Assassins gather in a bar. Guiteau toasts to the Presidency of the United States, speaking of his ambition to become Ambassador to France. Zangara complains about his stomach pains, and Booth suggests fixing them by shooting Franklin D. Roosevelt. Hinckley accidentally breaks a bottle, and Czolgosz flies into a rage, describing the horrors he sees in the bottle factory he works in, and how many men die or are injured just to make a bottle like the one Hinckley has just broken. Guiteau jokingly tells Czolgosz to find another job, and the two begin to argue about the American Dream, with Guiteau defending America and Czolgosz dismissing the "land of opportunity" as a lie. Czolgosz becomes enraged and grabs a bottle, barely stopping himself from throwing it across the room. Booth urges Czolgosz to take control of his fate by breaking a bottle himself, but Czolgosz cannot. A radio broadcast, narrated by the Proprietor, describes Zangara's failed attempt to assassinate Roosevelt. He misses Roosevelt and accidentally kills Chicago Mayor Anton Cermak instead. Five Bystanders are interviewed in turn, telling the audience their personal versions of the event; each is convinced that he or she personally saved the President ("How I Saved Roosevelt"). From an electric chair, Zangara sings his refusal to be afraid and that he hadn't cared who he killed as long as it was one of the men who control the money. Peeved that as an "American Nothing" he has no photographers at his execution, Zangara is electrocuted as the Bystanders preen for the cameras. American anarchist leader Emma Goldman gives a lecture from offstage as Leon Czolgosz listens, enraptured. He introduces himself to her and declares his love, but she tells him to redirect his passion to the fight for social justice. She gives him a leaflet that she tells him contains an idea that is "not mine alone, but mine." As she prepares to leave, Czolgosz offers to carry her bag, to which Goldman protests by saying, "They make us servants, Leon. We do not make servants of each other." Czolgosz, in his first display of assertiveness, still insists. Fromme and Moore meet on a park bench and share a joint. Fromme speaks of the apocalyptic preachings of mass murderer Charles Manson, remembering how they met and declaring herself his lover and slave. Juggling her purse, a can of Tab and a bucket of Kentucky Fried Chicken, Moore claims she is an informant for the FBI (or used to be), has been a CPA and had five husbands and three children. They connect over their shared hatred of their fathers, and using Colonel Sanders as a graven image, they give the bucket of chicken the evil eye and then shoot it to pieces while laughing hysterically. Moore realizes that she had known Manson in high school, and the scene ends as the women scream in delight over their memories of the charismatic killer. Czolgosz reflects on how many men die in the mines, the steel mills and the factories just to make a gun. Booth, Guiteau and Moore enter one by one and join him in a barbershop quartet in which they honor a single gun's power to change the world ("The Gun Song"). Czolgosz decides his gun will claim one more victim: the President. Czolgosz arrives at the 1901 Pan American Exposition and sees that William McKinley is shaking visitors' hands in the Temple of Music Pavilion. The Balladeer sings "The Ballad of Czolgosz" as Czolgosz joins the receiving line, and upon reaching McKinley, he shoots him. Samuel Byck sits on a park bench in a dirty Santa suit with a picket sign and a shopping bag. He talks into a tape recorder, preparing a message to Leonard Bernstein telling Bernstein he can save the world by writing more love songs, and explaining that he is going to change things by crashing a 747 into the White House and killing Richard Nixon. Then he accuses Bernstein of ignoring him, just like the other celebrities he has recorded tapes for, such as Hank Aaron and Jonas Salk. After flying into an expletive-laden rage, Byck stands up on the bench and angrily sings the chorus to West Side Story's song "America" before storming offstage. John Hinckley sits in his rumpus room, aimlessly playing a guitar. Lynette Fromme enters and tries to convince him to play her a song (asking for "Helter Skelter"), but he refuses. Fromme notices a picture of Jodie Foster, who Hinckley claims is his girlfriend. When Fromme realizes the picture is a publicity photo from a film, she pulls out a picture of Charles Manson and mocks Hinckley for being in love with a woman he's never met, which makes him throw her out in a fit of rage. Alone, he swears that he will win Foster's love "with one brave, historic act" and sings a love song to her while Fromme individually does the same to Manson ("Unworthy of Your Love"). An image of Ronald Reagan appears on a wall in the back of the stage, and an enraged Hinckley shoots it over and over again, but the picture keeps reappearing. The Proprietor mocks Hinckley by quoting Reagan's famous quips about the assassination as Hinckley fires and fires, missing each time. Back at the Proprietor's shooting range, Charles Guiteau flirts with Sara Jane Moore while giving her marksmanship tips before trying to kiss her. When she rebuffs him, he becomes suddenly enraged and attempts to attack her. Her gun goes off in his ear, and he backs off, angrily proclaiming that he is extraordinary and will be the next Ambassador to France. The scene changes to a train station, where Guiteau goes to meet James Garfield. He asks to be made Ambassador to France, but Garfield mockingly refuses, prompting Guiteau to shoot him. Guiteau is arrested and sent to the gallows, where he recites a poem he wrote that morning titled "I Am Going to the Lordy". When Guiteau finishes, the Balladeer enters and sings about Guiteau's trial and sentencing while Guiteau merrily cakewalks up to the noose, getting more and more desperately optimistic with each verse. Guiteau sings along with the Balladeer about Guiteau's optimism before he is finally hanged ("The Ballad of Guiteau"). Squeaky Fromme and Sara Jane Moore prepare to assassinate Gerald Ford. Moore has brought along her nine-year-old son and her dog (which she accidentally shoots), which causes an argument between the two women, who briefly turn on each other. Moore accidentally spills her gun's bullets just as President Ford enters the stage. Not recognizing him at first, the two women allow him to help them, but upon discovering who he is, Fromme tries to shoot him, but her gun jams. Having no other resource left, Moore tries to throw her bullets at Ford, shouting "bang" as she does so. Samuel Byck is driving to the airport to hijack a plane, which he plans to crash into the White House. Growing completely unhinged, he records a message addressed to Richard Nixon, complaining about contemporary American life, how the American public is constantly lied to, and announces that killing him is the only solution. The assassins congregate in the Proprietor's shooting range once again and enumerate their reasons for taking action. Led by Byck, they lament that they haven't gotten the rewards they were "promised." The Balladeer tells them that their actions didn't solve their problems or the country's and that if they want their prizes they must follow the American Dream. The assassins realize that they will never get their prizes, that no one will ever care if they live or die, and briefly sink into absolute desperation until Byck and the Proprietor lead them in "Another National Anthem," a song for all Americans dispossessed by the dream. The Balladeer attempts to convince them to be optimistic and seek other ways to be happy, but the Anthem grows louder and louder until the assassins force the Balladeer offstage (in the 2004 revival and many productions that followed, the Assassins all surround the Balladeer, transforming him into Lee Harvey Oswald). The scene changes to the sixth floor of the Texas School Book Depository. Lee Harvey Oswald sits with a radio and a pistol, preparing to kill himself, but he is interrupted by Booth. Surprising Oswald with intimate knowledge about his life, Booth slowly and carefully attempts to convince him not to become his own victim and to instead assassinate John F. Kennedy. Summoning the other assassins from the shadows, Booth tells Oswald that by joining them he will finally make a difference, but Oswald refuses. Booth tells him that in the future, when Hinckley’s room is searched, Oswald's biographies will be found. Summoning the voices of Arthur Bremer, Sirhan Sirhan and James Earl Ray, Booth tells Oswald that the key to the future is in his hands. Oswald tries to leave, but Zangara addresses him passionately in Italian, his words translated by the other assassins, imploring him to act so their own acts can come alive again. They tell him that he has the power to cause worldwide grief and inspire global passion about himself, a man the world has never cared or heard about. Calling themselves his family, the assassins sing, imploring Oswald to act. He crouches at the window and shoots ("November 22, 1963"). After the assassinations, a group of citizens recount what they were doing when they heard that the President had been killed and lament that even though only a single man died, the nation has changed forever ("Something Just Broke"). The assassins regroup once more at the shooting range, now with Oswald among their ranks, and they proudly restate their motto, "Everybody's got the right to be happy," before loading their guns and opening fire on the audience ("Everybody's Got the Right (Reprise)"). Notes: + In the original production, the lead part among the Assassins for "Another National Anthem" is sung by Byck. However, in the revised 2004 score the lead is sung by the Proprietor. Sondheim has said that he expected backlash from the public due to the content. "There are always people who think that certain subjects are not right for musicals...[w]e're not going to apologize for dealing with such a volatile subject. Nowadays, virtually everything goes," he told The New York Times. By developing the characters of historic assassins out of the slim biographical information found in the daily news, Assassins prompts us to consider their motivation. "(Sondheim) confronts pain in order to cauterize the decay and heal the sicknesses which lurk at the core of our society". Departing from the humanism of his previous musical Into the Woods, Sondheim suggests that political murderers are a product of the American political culture (Joanne Gordon). Historian and commentator Sarah Vowell introduced her 2005 analysis of the Lincoln, McKinley, and Garfield murders, Assassination Vacation, with a journey from New York City into New England to attend a performance of Assassins, the musical prompting her writing of the book (Vowell 2005). Although Assassins had not run on Broadway prior to 2004, the 1992 West End production and 1991 Off-Broadway production led to a ruling by the Tony Awards Administration Committee that the musical is a revival instead of an original musical. Recordings of both the Off-Broadway production and the 2004 revival are commercially available. The Off-Broadway version does not include the song 'Something Just Broke', which was added to the show for the subsequent London production. While the original Off-Broadway production used just three musicians, the original cast recording was fully orchestrated by Michael Starobin, with 33 musicians directed by Paul Gemignani. ↑ Michael Cerveris (2008). "Story of Assassins". Amazing Journey. Archived from the original on August 2, 2008. Retrieved 2008-08-09. ↑ Rich, Frank. "Review/Theater; Sondheim and Those Who Would Kill", nytimes.com, January 28, 1991. ↑ Michael H. Hutchins (2008). "Assassins". The Stephen Sondheim Reference Guide. Retrieved 2008-08-09. ↑ Ernio Hernandez. "The Shots Heard Round the World: Musical Assassins Opens on Broadway". Playbill. Retrieved 2008-08-09. ↑ Sarah Beaumont (December 14, 2003). "Something Just Broke". Sondheim.com. Retrieved 2008-08-09. ↑ Hertzfeld, Laura (December 3, 2012). "Neil Patrick Harris returns to 'Assassins', eyes return to Broadway". PopWatch. EW.com. Retrieved December 13, 2012. ↑ "Meersman, Brent". Theguide.co.za. Retrieved 2010-07-08. ↑ "Henry, Zane". Fdcawards.co.za. Retrieved 2010-07-08. ↑ Daily Bruin (1995-04-05). "The Daily Bruin | Kill a prez". Beta.dailybruin.com. Retrieved 2010-07-08. ↑ /DORA_AWARDS_10_WINNER_PR_FINAL.pdf "31st Annual Dora Mavor Moore Awards" Check |url= value (help) (PDF). www.tapa.ca. 28 June 2010. Retrieved 2011-01-18. ↑ "Assassins". Sondheim.com. 2008. Retrieved 2008-08-09. ↑ Zangara did kill Chicago mayor Anton Cermak who was with President-elect Roosevelt at the time of the shooting. ↑ Rothstein, Mervyn (27 January 1991). "Sondheim's 'Assassins': Insane Realities of History". The New York Times. Retrieved 17 July 2013. ↑ Gordon, Joanne (1990). Art Isn't Easy: The Theater of Stephen Sondheim (First ed.). New York: DaCapo Press, Inc. pp. 318, 337. ISBN 0-306-80468-9. ↑ The Off-Broadway production is audio CD ASIN: B000003F3N and the revival is ASIN: B0002B161Y. ↑ Rothstein, Mervyn (9 August 1991). "On Stage, and Off : 'Assassins' on Disk for the Ages". New York Times. Retrieved 4 July 2010. Sondheim, Stephen; Weidman, John (1991). Assassins (First ed.). New York: Theatre Communications Group. ISBN 1-55936-039-9. Vowell, Sarah (2005). Assassination Vacation (First ed.). New York: Simon & Schuster. ISBN 0-7432-6003-1. Sondheim, Stephen (2011). Look, I Made a Hat: Collected Lyrics (1981-2011) with Attendant Comments, Amplifications, Dogmas, Harangues, Digressions, Anecdotes and Miscellany (1st ed.). Alfred A. Knopf. ISBN 978-0-30759-341-2.